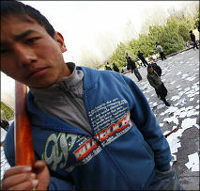 The most important outcome of the third day of revolution in Kyrgyzstan is the Bakiev’s appeal to the nation. He did not disappear as everyone tended to believe. He has not fled the country. He arrived in the south, Jalal-Abad, and rejoined the relatives and landsmen. He addressed the nation, noting he will not voluntarily give up. Kurmanbek Bakiev said he will struggle or at least negotiate. We do not know if the political opponents in Kyrgyzstan can run negotiations because they never really attempted to do so. Since gaining independence there has been no case when the government conducted peaceful negotiations with the opponents – and vice versa, which is no least important. In August of 1991 nobody negotiated with the communists. President Askar Akaev did not support GKChP; when the coup failed the communists realized their defeat and gave up power. Until 2005 President Akaev did not put many efforts to negotiate with the opposition – his major opponent Felix Kulov was serving the sentence in the colony. Before, during and after tulip revolution nobody tried to negotiate Akaev – the President fled the country and his house was devastated. Today, Bakiev says "If so-called and self-appointed provisional government wants to negotiate with me – I am ready to listen to them". For some reason, Dovlatov’s statement pops up in mind: "My compromise is the following: Moker kneels down and publicly promises to work honestly. Only then, may be, I will forgive…"
Kyrgyzstan does not have the tradition of peaceful transfer of power to the opponents. The ruling regime never conducted real dialogue with the opponents. In the last years Bakiev’s regime never provided the ground for opposition forces to speak out, except for meetings, streets and Central Square. The jinn is released, the looters are devastating the city, the task forces entered Bishkek. If the new government is able to quite the looters at any cost – promises, shootings, threats – it gets the chance to normalize the life. Otherwise, there is no such chance. Bakiev knows this perfectly and waits. If the chaos in the republic continues for few days it could be enough to wait. The crowd, not pacified in the first couple days, is able to turn against its leaders. "I know my country and people very well", Bakiev shared today in his interview to BBC. Today, many things depend on Russia that supported new government; today, when Bakiev more confidently gives interviews, Moscow may pretend that supporting statements were unintended. Moscow showed interest in the case and, therefore, it must help regulate this situation. On the other hand, USA also plays big role here. After some hesitation, Americans also diplomatically announced their support of provision government, headed by Roza Otunbaeva, turning away from "Kyrgyz inheritor" Maxim Bakiev that arrived in Washington DC to attend business forum. Diplomatically this means that US officials will never meet him. First and foremost, the normal existence of Kyrgyz state and society depends on newly established provisional government. It needs to calm down the looters, clean up the streets, glaze, and regulate new life and problems, accumulated in the last five years. Why does this government, facing so many challenges, must offer Bakiev to negotiate? Why does it need his opinion while few days ago he was getting rid of his political opponents? Bakiev is not the leader any more. His "big" statement is inappropriate attempt to support his pretended image by "national kurultai" rhetoric, legitimate and constitutional nature of election, where he "got the majority of votes". Nobody is interested in Bakiev as the political leader: neither Russia, nor US and Kyrgyz nation. Generally speaking it is not important whether he will resign voluntarily or not. The best (but least possible) option for him is to become the president in the small village of the Jalal-Abad oblast, surrounded by armed guards, managed by his brother. Kurmanbek Bakiev will be interesting for public only when he is brought to trial along with his sons, brothers, robbing the republic in the last years, sharpshooters, killing people at the main square, and looters, robbing the shops, banks and houses.